His rise in standing at the club was quick from there - Torres made his La Liga debut in his fourth consecutive appearance for Real Madrid, playing the whole 90 minutes against Real Zaragoza in January 2007 (1-0 home win). He kept his place in the side the following week for the game against Mallorca, with that performance leading coach Fabio Capello to state: "It is not easy to find a player with as much personality and talent in attack and defence as Torres". In February 2007, against Real Sociedad, Torres made his first assist: after a quick run on the left flank he provided a left-footed (he is right-footed by nature) cross for Ruud van Nistelrooy, whose header found the net as Madrid came from behind to win it away 2-1. With Torres as an important piece (first appearing in round 18, he only missed three contests until the end of the campaign, starting in all but one), Real Madrid won its 30th league title. However, he was unable to play in the deciding game against Mallorca due to a hamstring tear, but nevertheless in July 2007 he signed his first professional contract, joining the main squad permanently from Real Madrid Castilla. Although Torres appeared in more league games in the following season, he would start significantly less (as Madrid repeated league honours), primarily due to the signing of Argentine Gabriel Heinze. In that year he switched back to number 22, which he previously wore with Castilla. 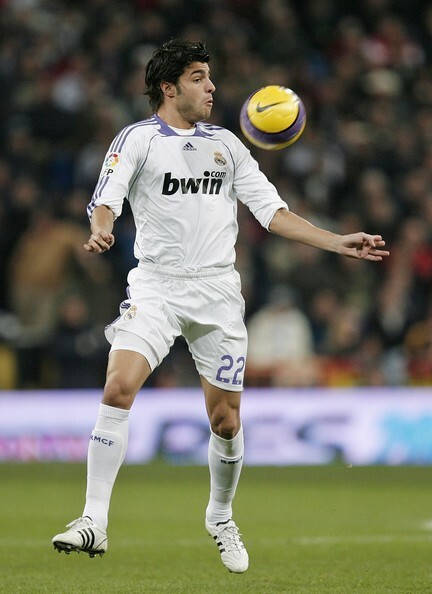 Miguel Torres of Real Madrid controls the ball during the La Liga match between Real Madrid and Zaragoza at the Santiago Bernabéu on January 6, 2008 - Real Madrid won the match 2-0. For the 2009-10 campaign, Torres changed to No. 2 following Salgado's departure to Blackburn Rovers. However, on 31 August - transfer deadline day - he moved to neighbours Getafe on a five-year contract, with Real having the option to rebuy in the first two. He became an undisputed starter for the next two seasons; however, in the 2011-12 season, under new manager Luis García, Torres was challenged by new signing Juan Valera for the right-back position. Nevertheless, he still appeared in more than 20 league games as the Madrid outskirts team again retained their division status. In August 2013, Torres joined Olympiacos from Greece on a three-year deal worth a reported €500,000, reuniting with Míchel who also coached him at Getafe and Real Madrid Castilla. However, after only ten competitive games he returned to Spain's top flight a year later, signing a one-year contract at Málaga with the option of two more. Lucas Vazquez of Real Madrid competes for the ball with Miguel Torres of Málaga during a La Liga match at La Rosaleda on February 21, 2016. He wasn't destined for much game time this season - and has played just one game so far. And yet, in October 2017, he was renewed until 2020. Yes, he may not start. But starters are not always the hero. The flashy guy is not always the hero. He is a hero - the silent hero. The ordinary reliable, dependable, hardworking man.